Well, if you haven.t heard... you're missing out! 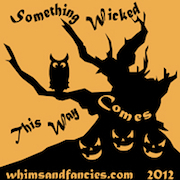 Soma has been hosting a Halloween blog hop the entire month of October. Each day someone posts with an original paper piece pattern. When I first heard about this a few months back I was super hesitant.. i've only been paper piecing for a few months and had never tried to make my own! Well, Soma is super supportive and encouraging so I decided to jump in. Not wanting to repeat anyone else's ideas as well as make something manageable, I went with a play on "Keep Calm"
As I was making it I adjusted the pattern pieces making them more blockish letters versus the pattern which is curvier. Also, this is a 10.5" block which means... those letters are teeny -- if you're new to paper piecing, tread carefully. The PDF's and templates are available. I will be updating them because for some reason the numbers did transfer over to the PDF file. (I spent hours trying to figure out EQ7 with this one) - I'll figure it out and get them up for you. Be sure to check out the rest of the designs, there is some serious talent in this group and I cant wait to try the patterns out! Thanks for sharing this great block, another one for in my quilt ! Hehehehe... Perfect saying for a busy ghoul... Thanks for the great pattern! A brilliant idea Jennifer! Love the paper piecing letters! Such a fun block! The keep calm have so many add-ons these days. I like the new blog look.